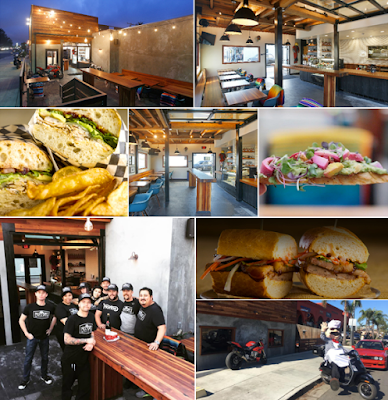 After a long delay, Moto Deli has opened along Highway 101 in the heart of Encinitas. Influenced by the traditional, European delicatessen but with an American spin, Moto Deli is helmed by newly minted Executive Chef Andrew Halvorsen (Stone Brewing, A.R. Valentien) and captures the Leucadian spirit while offering a nod to the time-honored techniques of whole animal butchery and artisanal charcuterie from its intimate 1,200 square-foot space within a 1920s-era building. A true delicatessen in spirit, Moto Deli offers a sandwich menu where everything is made in-house, from the freshly baked breads to the house made pickles, kettle chips, jarred condiments and sauces. With a background in charcuterie, butchery, and fine dining, Chef Andrew has worked in many of the city’s top kitchens, including Stone Brewing World Bistro & Gardens-Escondido, where he trained under Moto Deli co-owner Alex Carballo. After two years at Stone, Andrew joined the culinary team at the The Lodge at Torrey Pines, where he worked directly under Executive Chef Jeff Jackson. Teaming up with local entrepreneur Mario Warman and reuniting with Alex Carballo to open Moto Deli, Chef Andrew brings his commitment to fresh, locally-grown fare to the new menu. Highlights from the sandwich menu include the Chicken Milanesa with beans, Oaxaca cheese, avocado, lettuce, pickled onions and chipotle crema on a torpedo roll, as well as the Porchetta sandwich, made with lemon caper aioli, crispy capers and arugula on ciabatta bread. Moto Deli will also offer an impressive selection of smoked meats, charcuteries, house made condiments and artisanal cheeses, all of which can be purchased as grab-and-go items. Moto Deli will also offer a convenient scooter delivery service, which will be available for catering and special events.